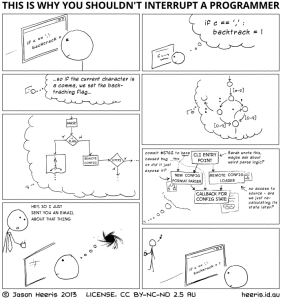 Programming can be hard. It’s common to sit with a programming problems for hours, days, or weeks until settling on a solution. After spending extended periods with a problem the mind often settles into fixed views of problems and solutions. Adopting fixed views in problem solving reduces the likelihood of discovering creative and elegant solutions. 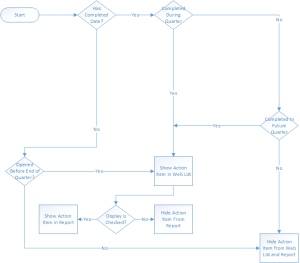 Take for example, these flow charts. 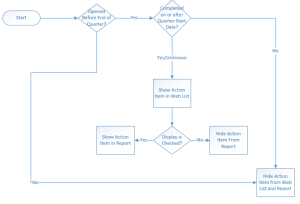 The first flow chart is an early attempt of mine to map the business logic needed to display tasks in an interface and in a report. The image that follows has the same requirements, but is a vastly simpler solution. This is a simple example and the differences between the two flow charts may seem inconsequential. On the contrary, the first flow required about three times as much written code and would have been much more challenging to maintain. I was also able to reduce the number of unit tests because the problem was much simpler than I originally thought. The simplification of this flow chart did not come to me by searching aggressively for it. In fact, I thought the first solution was just fine. It was in a moment of pause that a flash of intuition hit me: “Every task has an Opened Date and any Completed Date must be greater than or equal to the Opened Date. Why am I checking for a Completed Date first, when I could already have useful information about it from the Opened Date?” This question was enough for me to pull up Visio for some experimentation. The definition of intuition is “the ability to understand something immediately, without the need for conscious reasoning.” The bustle of daily life can drown out the voice of our intuition often leading us to move from thing to thing to thing to thing without consideration. Meditation is a practice that helps us access our inner intuition on an increasingly regular basis. Novices start to gain access to their inner intuition after only a short span of regular practice. Some meditation practitioners have spiritual beliefs that are used in conjunction with their practice, but the act itself is inherently secular and can be executed without threat to religious beliefs. It can be and is often used as a tool to help people tap into their intuition, achieve greater focus, improve relaxation, acquire relief from distraction, and live in an overall more peaceful manner. Meditation can come in many forms. Contrary what we see in popular media, it is not a practice reserved solely for mystics seated in a full lotus or bald dudes in orange robes living in solitude on mountain-tops. The physical expression of meditation looks like different things for different people. Some prefer to be seated, others prefer to lay down, some prefer yogic postures, some even walk. The list goes on indefinitely, but the purpose is usually the same: to come to a full experience of this moment. How does this help my programming, you ask? As ambitious programmers, we are looking for a challenge to propel us into next-level problem solving. We juggle abstract representations, complex objects, and nests of composed algorithms. We translate seemingly straightforward language into logical constructs. Often the language of our requirements seems benign, but if we’ve been doing this a while we’re not so arrogant to believe translating it will be a simple task. We have to consider the ilities: flexibility, scalability, readability, maintainability, and testibility (among several others). The adjacent comic by Jason Heeris is a perfect illustration of our daily struggle to get and stay on task – so why would we choose to interrupt that? Meditation is a tool that can be used to spot check a situation – i.e. relax into to the present, remove distraction, increase clarity, etc. However, it is the aggregate of the meditation practice that presents us with long term benefits we want regular access to. It’s not a coincidence that we experience many of our Eureka moments while in the shower (or attached to other porcelain devices). It’s in these places that we have the most opportunity to be detached from working on our problems and have a single simple task for that moment. This basically sums up what we are trying to achieve with meditation. With intention, we practice a single simple task: being present with the immediacy of our experience (so that we learn to continually access the simplicity of now). Spot check meditations certainly have value, but that value is compounded by the aggregate of the intentional practice. A common reason not to meditate is the time commitment. This should be less and less a concern as there is an increasing amount of research that suggests regular mindfulness (or meditation) practices increase overall well-being and decrease the need for sleep. (A quick search on reddit shows the majority of users in this thread experience better sleep and need less of it to function optimally.) My personal experience is that I have fewer sleep disturbances, fall asleep faster, and wake up easier with an intact practice. My meditation routine is the first thing I do – I wake up with enough time built in to get it done so that I have no excuses for not doing it. This is the same tactic that self help coaches and athletic coaches all prescribe in order to increase the chance of success for a healthy practice. You don’t have to meditate for hours at a time to get the benefits. In fact, you can start with just a few minutes to see how it goes. As you start to access the benefits of meditation you might change how long you practice, how often you practice, and what methods you practice with. Guided meditations can also be very useful for learning about different styles to discover what works for you. The author Sam Harris offers a couple great guided meditations. Here is his 9 minute guided meditation and his 26 minute guided meditation. Tara Brach also has an extensive library of guided meditations. This is a basic meditation by Tara for meditators of all levels. Many novice meditators find brainwave entrainment to be a very useful tool to supplement the meditation experience. The basic idea is to use audio and visual stimulus to induce progressively deeper meditative states. Listening to binaural beats with stereo headphones is one example of entrainment (note that you only need to listen to these just loud enough to hear a wavering). Isochronic tones are similar to binaural beats (these don’t require stereo headphones). The Kasina by Mindplace is a very neat (but expensive!) device that combines audio and visual entrainment techniques. This device is really cool and helped me enter some very deep states. I have mixed feelings about entrainment, but since I’ve used it extensively it deserves a place in this post. Entrainment is a great way to get started with meditation, but does not seem to be a long term solution. If the purpose of meditation is to practice accessing the immediacy of my experience then I should eventually learn to do so without outside help. Don’t get me wrong: entrainment meditation is vastly superior to no meditation, but my current preference is to do without it. I’d like to address the phrase “just clear your mind.” It is not possible to actively engage in clearing the mind. This requires thinking, which is the opposite of the intention behind it. A consistent and intentional practice will lead to moments of still mind, but even the most famous gurus will tell you that you cannot escape the thinking nature of the brain. That’s just what it does. Pema Chödrön suggests that when we notice that we’re thinking during meditation, that we do just that: notice it. We give it a label “thinking” and we might move on from the thoughts. If we don’t, we continue to label the thoughts “thinking.” The most important part of this is to do so in a non-judgemental / compassionate way. We don’t chastise ourselves for doing the thing we’ve been conditioned to do since birth. We just notice it and maybe move on.